Happy October! 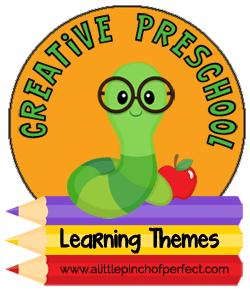 It’s time to officially start doing Halloween activities with our second Creative Preschool post. 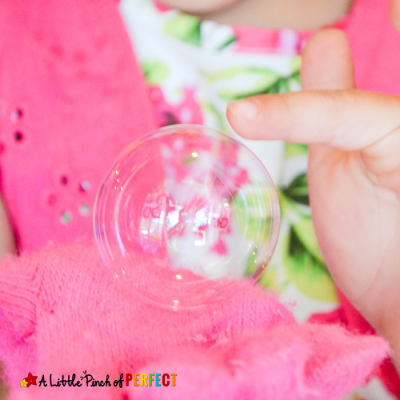 Today we have 3 activities and free printables with all sorts of great objectives like sensory play, fine motor skills, counting, and creating. Our first activity is a 5 Little Pumpkins art project. I am pretty proud of what we came up with and I hope you enjoy! In case you where wondering, I will share our last letter E activity in our Letter of the week A-Z series tomorrow. It’s a simple one, so it will be great for the weekend! Kids can sing and count with this fun 5 Little Pumpkin Craft. 1. Glue your black piece of paper onto your thick paper. I used part of an old file folder. Glue your brown foam or brown paper onto the black paper to make the fence. 2. Cut fruit cups in half and spray the outside of them orange. Once the cups are dry, glue them to your paper and glue googly eyes in place. If you don’t have googly eyes you could use a permanent pen to draw eyes and a face on or cut out pieces of black paper and glue them on. I used hot glue because I wanted everything to stick well, and dry fast. 4. 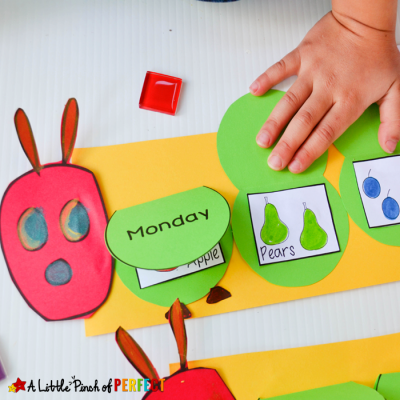 Print out the page of leaves from the printable on green paper and let kiddo cut them out. Fold a small portion of each leaf and glue it above each pumpkin like a lid. 5. 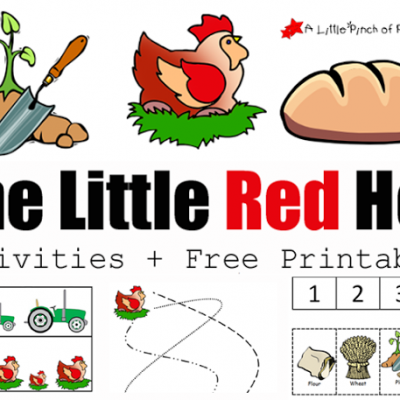 Let kiddo cut out the numbers and shapes from the printable and use crayons to color them. 6. Glue the numbers to the inside of each leaf. 7. To Sing the Song you could lay the pictures out on the table and place them inside the pumpkins while singing or you could place them inside of the pumpkins and pull them out while singing. It’s up to you. The number of pictures corresponds with the number on each pumpkin so count and sing as much as possible :). For some added fun, I put poster board stars inside our pumpkins to make them glow. Teach kids how to weave while making a cute and simple Halloween craft. 1. Decide if you want to weave around, or across then cut strips of tulle that are long enough to go around the mat once, or across the mat once. Make sure to leave a little extra length just in case. 2. Tie a knot at the end of the tulle and start weaving. Continue weaving until the mat is completely covered. I showed Ms. Tiger how to weave, and told her it was a simple, “Up, down” pattern. I was surprised she took right to it and needed no further assistance. I could hear her saying, “Up, down.” According to my mom, some of her 6 year old students had difficulty getting the hang of weaving so make sure to help when needed to avoid frustration. 3. 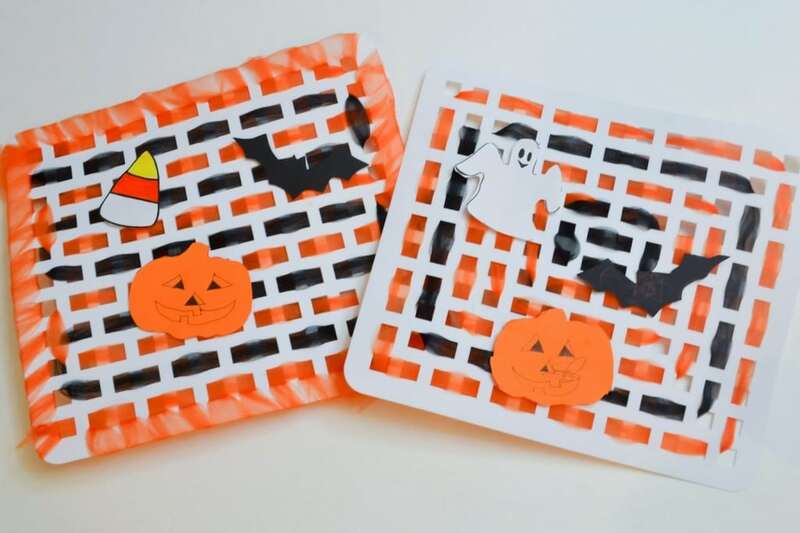 Cut out Halloween shapes, decorate them with markers, then tape them onto your mat to complete your Halloween decoration. This activity is inspired by Rachel’s post, Pumpkin Play Dough Invitation to Play at I Heart Crafty Things. 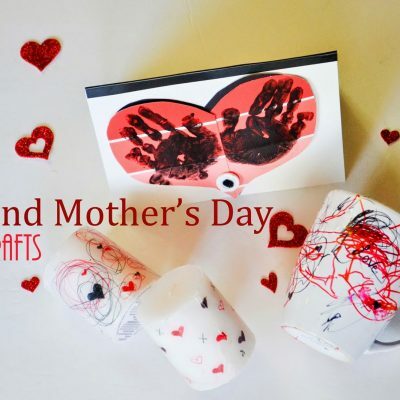 Her post includes some great ideas for supplies as well as a great list of Pumpkin themed books. 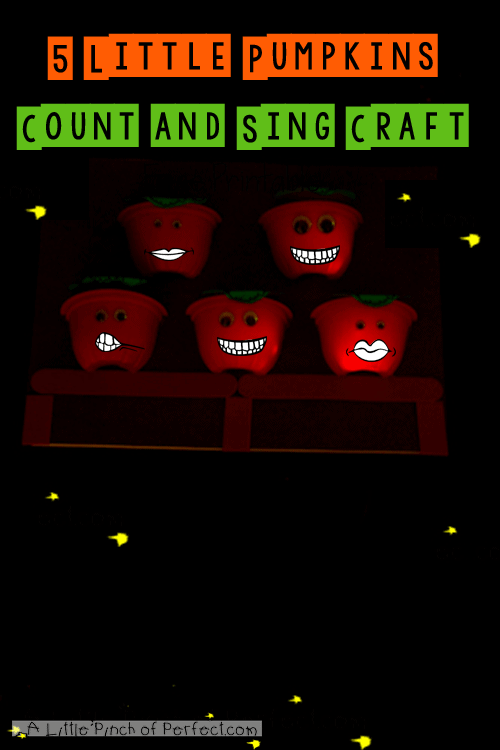 This game will have you counting and laughing while making some funny pumpkin faces. 1. Make the spinner by cutting out the circle and arrow from the printable. Glue the circle to your paper plate. Poke a hole in the center. Tape the arrow to your bread tag. Place the bread tag around the toothpick then poke it in the center of the spinner (The bread tag made it easier to spin). Turn the plate over and secure the toothpick with tape. If you don’t feel like making a spinner, just use some dice. I used a Halloween themed cupcake topper by Wilton Cakes to make our spinner. 2. Cut the rectangle out with the list of pumpkin face parts. Gather supplies to decorate pumpkin and set everything out. 3. To play the game: Start at the top of the list of pumpkin face parts. Have child spin the spinner, then select the supply they want to use to make the pumpkin face part. Count out the number of pieces the spinner landed on and place them on the paper. Repeat until all parts have been accounted for. We counted all our parts before putting them on our play dough pumpkin. This pumpkin has 12 pieces total. 4. Place parts on the play dough pumpkin. We made some pretty funny looking pumpkins. That is the fun and silly part about this game, you never know what your pumpkin is going to end up looking like. We hope you enjoyed our Halloween preschool activities today. Hi Amanda, thanks so much! I totally agree, it would be so much fun to have your kiddos join us! Hi Eileen, thanks so much. The kids loved it! all of these are fantastic! Your kids must be having alot of fun with all the Halloween activities! Love the glowing pumpkins! 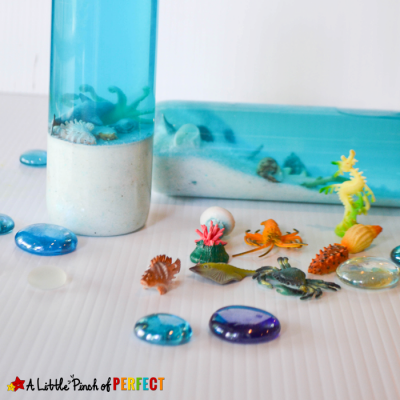 What great activities for preschoolers! Wow, these are some great ideas! I Pinned it!